Please contact us with any further questions about the Advanced Foot Energizer you may have. You may also look through the online manual. When you order your Advanced Foot Energizer or Advanced Foot Energizer Platinum Package we ship either the same or next business day. We ship from warehouses in Washington State, Utah, and Tennessee so that 96 percent of the United States can expect to receive their package two days after shipment. Body Pads and other items are shipped by USPS First Class mail and generally take two to four days for delivery to most of the United States. Free standard ground shipping & handling worth up to $30 for deliveries within the contiguous US and Canada only. Orders shipped to Canada will process through customs and may have duty added at the destination. Open Box products ship on business days before 3:30 PM from our warehouse in Washington State. 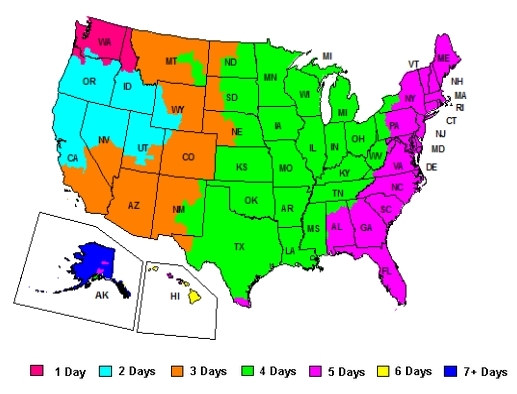 Within Washington and Oregon deliveries are by USPS. Most other states are by Fedex Ground for business or Home Delivery for residential. Do I need a prescription to buy an Advanced Foot Energizer? You don’t need a prescription to buy an Advanced Foot Energizer. It’s been cleared by the FDA for sale “over-the-counter” so you can purchase one without spending money to visit a doctor for a prescription. Can I use the Advanced Foot Energizer along with lotions or topical ointment? Topical ointments like pain rubs, lotions, sun tan oil, etc. are best used either after you are finished using the Advanced Foot Energizer or long enough prior that there is no oily residue on your feet or skin. We recommend cleaning your feet (or skin where you may be using the body pads) with soap and water or an alcohol wipe if you have oily skin. Sometimes using our water based gel will help with electrical conductivity for your feet. This is especially true if you have very dry skin on your feet. How big is the Advanced Foot Energizer? The Advanced Foot Energizer is designed to fit under your feet, holding them at an optimal angle for relaxed stimulation, while you are sitting in a chair or on a couch. The unit itself is 45 centimeters (under 18 inches) high by 47 centimeters (18.5 inches) wide by 18.5 centimeters (7 1/4 inches) deep. It weighs just 75 ounces (4.6 pounds) out of the box. Can I reuse the adhesive body pads? Yes. The body pads will normally last for up to 20 to 30 uses. This may vary by skin type and humidity. We recommend that you store the body pads on their plastic inside a zip-lock bag. You may also use a drop of water on them prior to use to help keep them moist longer. Re-usable adhesive pads do not work as well once they have been used 20 to 30 times. Even though they may still stick to your skin they begin to loose conductivity. Please use Advanced Foot Energizer pads to get the best experience. Where can I buy additional adhesive body pads? You may buy new adhesive body pads from any Advanced Foot Energizer authorized dealer or directly through this website. Adhesive body pads come in packages that contain 4 pads each. You may also join the Advanced Foot Energizer adhesive Body Pad Club for extra savings. When you join the club you will automatically receive the quantity of body pads you would like either monthly or every-other month. The pricing for the pad club includes shipping and handling. How does the Advanced Foot Energize reduce pain and condition muscles? The Advanced Foot Energizer works by stimulating the nerves and muscles of either your feet and legs or where the body pads are located. While operating in TENS modes it works by sending electrical signals to the brain faster than your body’s pain signals, which effectively blocks the pain symptoms. This is called “gate theory” by medical practitioners. While operating in EMS modes it works by stimulating the nerves and muscles to gently contract and release. This in turn increases the blood flow and circulation – moving toxins away from the area. It also conditions the muscles while gently reducing pain. Both systems release your body’s endorphins – your own natural pain relieving system of chemicals. How long should I use the Advanced Foot Energizer or Body Pads? The timer on your unit is set for 25 minutes. You may also end your session early by pressing the off button on the unit until the LED display goes out – or use the remote control the same way. You may use the Advanced Foot Energizer for consecutive sessions if you desire. When you first turn the Advanced Foot Energizer on you will not feel anything. As you increase the intensity you will begin to feel a gentle tingle. When you reduce the intensity the tingle will diminish. Sometimes the feeling is strange for some people at first – but they get used to it fairly quickly. As you use the Advanced Foot Energizer daily you will notice that you can increase the intensity further and feel the sensation moving up your legs. Remember that the goal is not to reach the maximum intensity level (99) but to find a level that is comfortable for you while still activating your muscles. Can I adjust the intensity and what are “modes”? 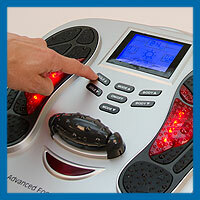 The Advanced Foot Energizer features 25 different programed modes. These “modes” are each different sets of electrical programs (combinations of wave patterns and frequencies) that offer a variety of sensations so that your muscles do not develop “muscle memory”. Changing the modes will help you get the most benefit from your energizer. If you change modes during your session the intensity level will default back to zero so that you do not experience any surprising stimulation increases. The timer will continue its countdown while changing modes. The Advanced Foot Energizer also operates with intensity levels 1 through 99. This wide range offers you the ability to very minutely increase the intensity of your massage so that you can maintain a comfortable session. You will very likely increase the intensity during your session as you become accustomed to the feeling of the stimulation. Because we want to protect you from sudden increases in intensity, both the remote controller and the panel on the unit only allow you to step up a level by pressing the button each time. Remember that the goal is to not reach the highest intensity but to find intensity levels that are the most comfortable for you. There are multiple ways to use the Advanced Foot Energizer. First by choosing EMS or TENS. The EMS modes are 1-8, the TENS modes are 9-25. Under each of these technologies the stimulation is further broken down by the different mode programs. Each of the modes offers a different sensation that reacts with your nerves and muscles in different ways. When you try the different modes you can actually feel the difference in the way they work. Mode 1 for instance is pretty mild, while mode 7 is a bit stronger and you’ll feel it pulling the muscles up your legs. The modes come close to mimicking the experience you would have from having that type of massage from a practitioner. For instance the “cupping” sensation in mode 15 feels like there is a suction on the bottom of the foot pulling the muscles downward. Unlike some machines, the foot pads on the Advanced Foot Energizer are divided into different areas that target individual parts of your feet. These areas are referred to as “foot meridians” in Chinese medicine. In reflexology, the understanding is that all the different parts of your body are connected to the soles of your feet. Stimulating the specific areas of the bottom of your feet can help to improve your overall health. Because it uses this unique combination of Chinese and Western medicine the Advanced Foot Energizer is an excellent choice for treating your painful and tired feet. Sometimes I feel the sensation from the Advanced Foot Energizer more strongly than others. Why is that? There are a number of factors that impact how you respond to electrical stimulation and how sensitive your body is to that stimulation. Factors such as your body’s hydration level, fatigue level, electrode placement (body pads), whether you have recently exercised or performed other strenuous physical activity, either alcohol or caffeine consumption, showering or bathing (including swimming and hot tubing), exposure to the sun, dry skin, and more. You may also notice that your sensitivity to the electrical stimulation changes over time. One of the reasons there are 25 different programed modes is so you can choose different modes so that your body does not become too accustomed to one program. Where can I use the Advanced Foot Energizer? You can use your Advanced Foot Energizer wherever you can sit down with an outlet nearby. Just make sure that you aren’t around a wet surface or too close to other strong electrical appliances. We use ours at work under our desks, and at home while we are watching movies. The Advanced Foot Energizer is safe for use by adults. Because it is drug free it is not chemically addictive. Can I use the Advanced Foot Energizer if I have a Pacemaker or AICD? No. The Advanced Foot Energizer should not be used if you have a pacemaker or other AICD such as a defibrillator or other internal electronic device. It is also contraindicated for use with other electronic metal medical devices that may be implanted in your body. Please see more contraindications and warnings. I have an implanted nerve stimulator, is it safe for me to use the Advanced Foot Energizer? When you purchase an over-the-counter electrical stimulator like the Advanced Foot Energizer it is contraindicated to use along with another implanted electrical device. The electrical current runs from one foot to the other foot and through your body which could cause issues with your implant. Because of this we recommend that you do not use the Advanced Foot Energizer along with your implant. Please see more contraindications and precautions for electrical stimulators. Where shouldn’t I use the Advanced Foot Energizer or Body Pads? Do not use the Advanced Foot Energizer foot massager and electrical muscle stimulator on vital parts, such as carotid sinus nerves, across the chest, or across the brain; use caution in the use during pregnancy, menstruation, and other particular conditions that may be affected by muscle contractions; potential adverse effects may include skin irritations and burns. Is the Advanced Foot Energizer cleared by the FDA? Yes. The Advanced Foot Energizer is cleared for sale over-the-counter by the FDA. It is a class II medical device and as such falls under the guidelines regulated by the FDA. This means that the FDA has found the Advanced Foot Energizer to be significantly similar to other devices that it has approved for sale (in this case a TENS machine and an EMS machine) and as such the FDA allows it to be marketed in the United States. The Advanced Foot Energizer was cleared for sale by the FDA in November, 2014. Will the Advanced Foot Energizer work for chronic pain? The Advanced Foot Energizer is designed for use by people with chronic pain by adjusting the intensity levels of the different modes (9 through 25 most effectively) to help relieve pain as you need it. The technology is proven for temporary pain relief. How easy is the Advanced Foot Energizer to use? 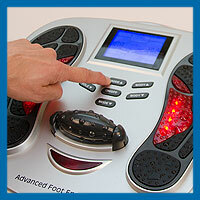 The Advanced Foot Energizer is one of the easiest tools to use to renew the energy in your feet. Often we assume that technology will have to be monitored or utilized with supervision. Using the Advanced Foot Energizer is as easy as slipping your feet into a pair of bedroom slippers and turning on your TV with a remote. The 25 minute timer automatically shuts the energizer off. Just turn it on by pressing and holding the ON/OFF button until the large blue screen lights or by using the remote control. Then adjust the mode by using mode up or down (solid up and down arrows) and the intensity by using the intensity up or down (solid up and down arrows). You are done when the time reaches 25 minutes or when you press and hold the ON/OFF button again or use the remote control to turn it off. Sit down and place the soles of your feet on the foot shaped pads. Choose a mode between 1 and 25 by using the buttons on the Energizer or on the remote control. Either use the buttons on the Advanced Foot Energizer or on the remote control to gradually increase the intensity (strength). The first sensation you feel will be a tingling sensation. If you keep increasing the intensity level you will feel a strong and comfortable massage in your feet and calves. Use the remote control or the buttons on the energizer to adjust the levels any time during your treatment. The timer is set for a 25 minute session. We recommend that you use the Advanced Foot Energizer at least once a day for the first 30 days for optimal results. Can I use the Advanced Foot Energizer if I am pregnant? No. Powered muscle stimulation is not recommended for use while pregnant. Will the Advanced Foot Energizer bother my skin? While it is unlikely, some people find that powered muscle stimulation may cause minor skin irritation. Some people may have a reaction to the gel that is used in the body pads. These people will be happy to know that the feet pads on the Advanced Foot Energizer do not react chemically with skin. 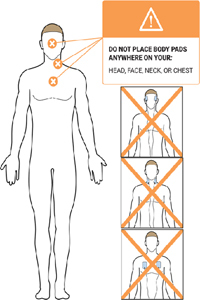 While we have tested our body pads on many individuals with no reaction. We recommend that if you do experience a reaction to the body pads (redness or itchy skin after you end your session) please discontinue using them. Some specialty pads have been developed with a low allergy gel which may work for you. Please visit Pain Relief Essentials to learn more. Where can I learn more about EMS and TENS? Please visit our Learning Library to learn more about Electrical Muscle Stimulation and Transcutaneous Electrical Nerve Stimulation. You may also find more answers to common questions about electrical muscle stimulators. How much does the Advanced Foot Energizer cost? The suggested manufactures retail price for the Advanced Foot Energizer is just $449.95 US. Sometimes retailers may have further discounts or coupons available. Traditional TENS and EMS combination stimulators would cost between $600 and $900 US. Many of these units require a prescription from a doctor as well as an office visit. Because we are able to keep corporate costs and our marketing costs low, we are able to pass along those savings to you. Join our email club to learn about occasional and seasonal offers. My Advanced Foot Energizer lights for about 2 seconds and then turns off – What do I do? 1. When you connect the Advanced Foot Energizer to power it will briefly turn on and then off. 2. On the device itself press and hold the on button until it lights. If using the remote you do not need to hold the button. 3. Then choose a mode. If you do not choose a mode it will turn back off in about 15 – 20 seconds. 4. After choosing a mode press the “Sole” or “Body” up button right away and it will begin the 25 minute counter. You may then increase intensity to a comfortable stimulation level. If you do not press the up button for intensity right away to start the timer it will turn back off in about 15 – 20 seconds. See more operating instructions.